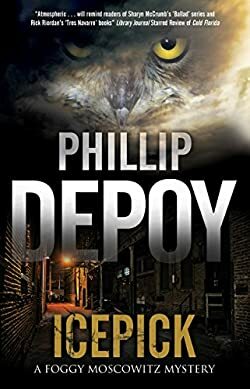 Phillip DePoy (website) is an American author known for several mystery series: Flap Tucker, Fever Devilin, Foggy Moskowitz and Christopher Marlowe, the last one being a historical mystery series. Phillip DePoy was born in 1950 in Rockford, Illinois. At the age of five, his family moved to Atlanta. He always wanted to write. In the 10th grade, he submitted his first short story to his teacher. After reading it, his teacher encouraged Phillip to become a writer. He started writing poems at the age of 14 and in 1973 he published his first poem at the age of 23. At the age of 15, in 1965 he started his professional career with the Actors and Writers Workshop. After getting a masters degree in performance art, he became a writer in residence for the Georgia Council for the Arts. Before writing fiction novels, Phillip also wrote plays for the stage. He also directed several plays (including Beowulf) and was the director of two university theater programs. Over the years he has worked as director of several university theater programs. In 2002 he received the Edgar Award best mystery play for Easy. Some of his books were nominated for various awards as well (Shamus finalist). Currently, Phillip DePoy is director of theater at Clayton State University, as well as a mystery writer. In addition to his series, he also wrote a standalone mystery called The King James Conspiracy. Flap Tucker is a detective with a special ability: he is using his intuition to find lost things … or people. And he relies on meditation rather than on a gun to do so. Fever Devilin is a folklorist who has returned home to the Georgian Appalachians, leaving behind the world of the academia. But when he returns, home is not quite the way he left it behind. Foggy Moskowitz is a Jewish former car thief and current amateur PI working in Florida in the Child Protective Services in the early 1970s. Christopher Marlowe, the famous English playwright, poet and alleged spy in the late 1500s features in his latest series, which currently includes two books. Here are the Phillip DePoy books in order for all his series.